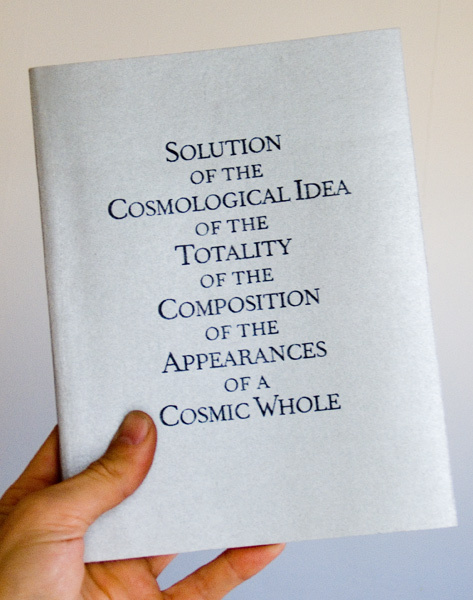 Solution of the Cosmological Idea of the Totality of the Composition of the Appearances of a Cosmic Whole is a book about the relationship between fiction and reality. Set in 1968 and 1969, each of the book's three "chapters" appropriates a distinct rhetorical model: public speaking, radio, or newspaper journalism. Each of the three texts embodies, through manipulation, a distinct, skeptical approach to government, the media, and photography. 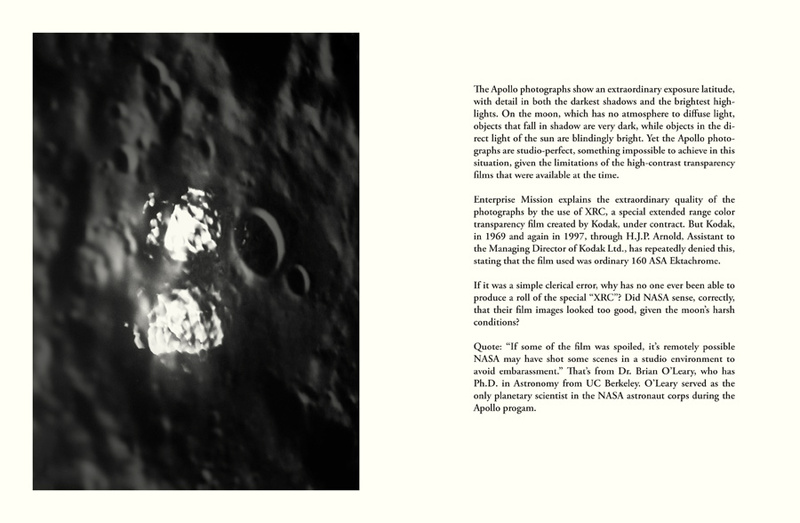 The first part of the book is written in the voice of an activist, who questions the veracity of the documentation of the moon landing. 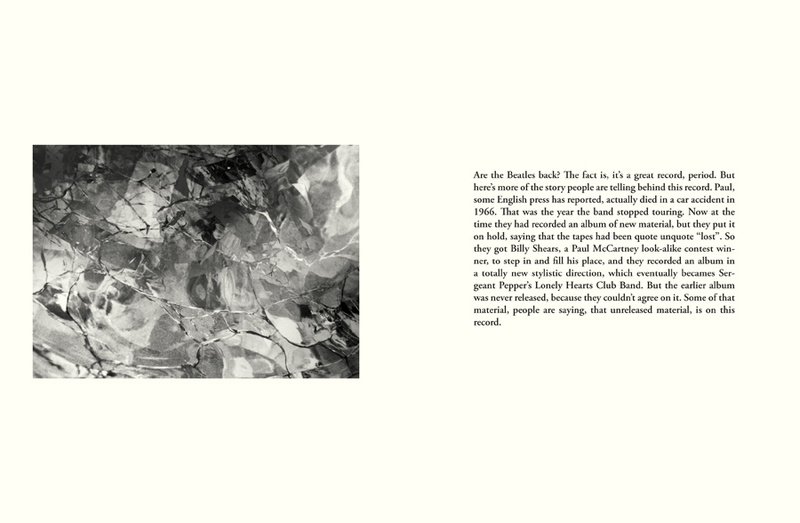 The second part is written in the voice of a radio DJ, who explores the theory that an album by the rock band Klaatu is really by the Beatles. The third section includes multiple Associated Press clippings about students who supposedly went blind from staring at the sun while on LSD. These stories were later cast into doubt, but were never publicly retracted. Playing the obviously true against the obviously false, the texts expose the gap between an event and its representation. 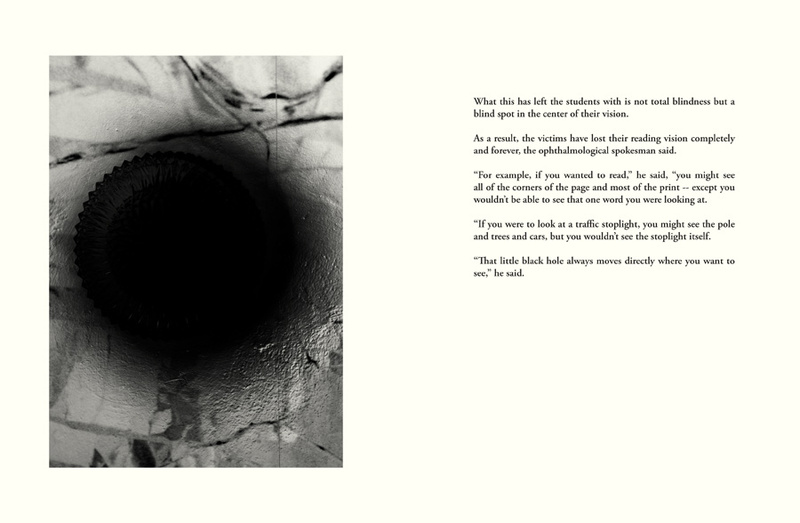 The book is illustrated with black and white photographs, created by rephotographing details from two large prints. This project was realized during a residency at the Château de La Napoule in Mandelieu, France, in 2004. Open edition. First printed in 2004. Reprinted in 2010 with a different binding. Perfectbound laser-printed interior pages with screenprinted iridescent silver cover.